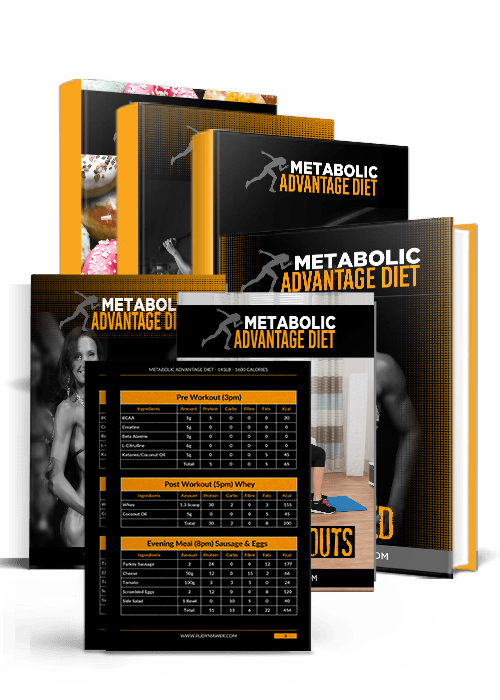 The Metabolic Advantage Diet (MAD) is an advanced Ketogenic plan created by world renowned female fitness expert and Ketogenic Diet researcher Rudy Mawer. It gives you all the tools you need to transformation and lose fat 342% faster (based on scientific studies) including full 7-day meal plans tailored to your metabolism, 20 weeks of gym and home workouts, supplement protocols and videos - It works so well, we even offer a 100% results guarantee! Full 7 Day Meal plans based on your metabolism! 20 Weeks worth of workouts with step-by-step guides! Scientific manual explaining all the benefits & research! Easy to follow videos for each exercise! Private FB support group with Rudy & over 40,000 members! Bonus recipe book with 80 Ketogenic Recipes! WAIT! Add 15 Advanced Leg/Booty Workouts to your order for less than $1 PER WORKOUT! 100% Results Guarantee WITHIN 30 DAYS! - For just $12.95 more (normally $49) you can get 15 highly advanced glute/booty workouts to slot right into your Metabolic Advantage Diet that are GUARANTEED to boost your glutes/leg growth or you get your money back!